Manhattan Prep’s 4th Edition GRE Strategy Guides have been redesigned with the student in mind. With updated content and new practice problems, they are the richest, most content-driven GRE materials on the market. 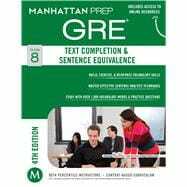 Written by Manhattan Prep’s high-caliber GRE instructors, the Text Completion & Sentence Equivalence GRE Strategy Guide provides a comprehensive approach to the vocabulary-based questions on the GRE. Learn core principles and useful techniques for taking cues from the given sentence, anticipating correct answers, and eliminating wrong answers. Delving deeply into both of the GRE’s vocabulary question types, this Guide provides straightforward step-by-step processes, detailed examples, and built-in exercises to hone particular skills. It is designed to ensure that, not only do you know the vocabulary being tested, but you can also use those words in context with ease and efficiency. Each chapter provides comprehensive coverage of the subject matter through rules, strategies, and in-depth examples to help you build confidence and content mastery. In addition, the Guide contains complete problem sets, with detailed answer explanations written by top-scorers, and numerous exercises that you can use build accuracy and speed. Purchase of this book includes one year of access to 6 Manhattan Prep online section-adaptive GRE exams. The Manhattan Prep philosophy is simple: We aim to help students achieve their goals by providing the best curriculum and the highest-quality instructors in the industry. Manhattan Prep hires fewer than 1 in 10 qualified applicants for its teaching positions, ensuring every instructor has years of experience and a 99th percentile score. So you can trust our books are developed by the very best.